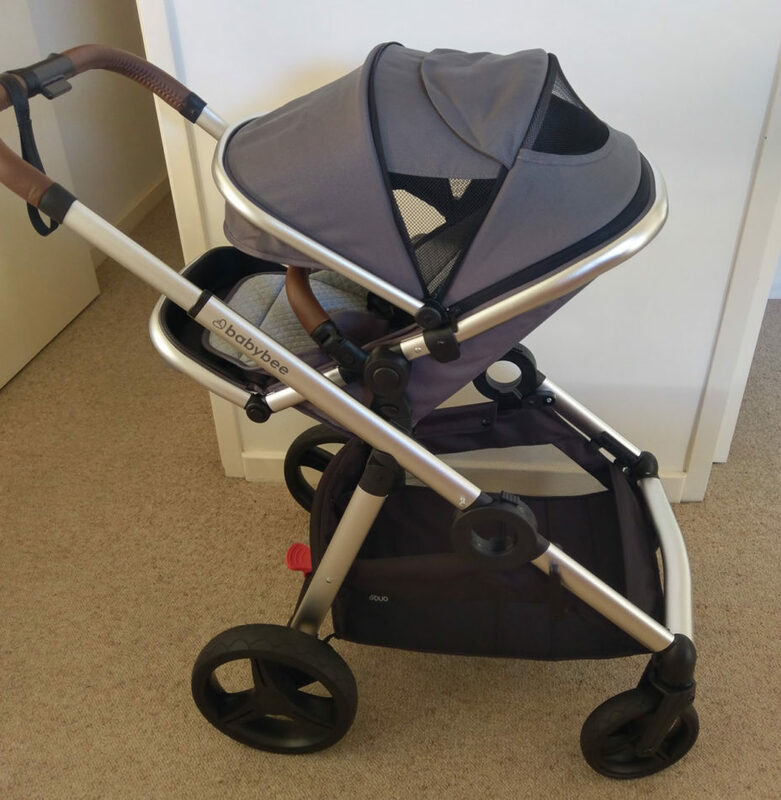 This review of the Babybee Prams Babybee Duo is a reader review submitted by father-to-be Greg. If you’d like to review your own pram and earn yourself a $50 gift voucher as a “Thank you” then check out our Parent Product Reviews page and get in touch with us for more information! “So… it’s been just over a week since we took the chance and made the sight unseen online purchase of the new 2019 model Babybee Duo and we’ve still been in the “trial” mode in our lounge room so that if we come across something we like better, we can take advantage of the free returns within 9 months of purchase. It’s a pretty good offering from Babybee Prams, but given that they only sell online and don’t do demo days or similar, they really have to make it as easy as possible for prospective purchasers to know that they are going to be looked after. Taking the plunge on this model was made a bit more tricky because the timing of our order has coincided with the first batch of deliveries for the new 2019 model, which means that there has been no online reviews available. Knowing that it’s not easy to get good review information (and knowing how much we appreciate when we’re able to learn from the review comments from others) has been a big part of the reason why we thought we’d do our bit to give prospective purchasers a better understanding of this pram. Choosing a pram has been difficult. We’ve never paid attention to prams in the past so really didn’t have much of an idea on what we were looking for. We soon came to the realisation that our criteria list needed to expand, and that we were probably not going to have every want and wish granted (we’re picky) as there is no such thing as a ‘perfect’ pram. And it was getting to the point where we might find ourselves paying over $1000 on a pram… because good prams are expensive! We started our pram purchasing journey with a visit to Baby Bunting to get an overview of the types of prams on offer. Being first time parents, shopping for a pram has been quite an interesting experience! I’ve found it to be not quite as bad as shopping for light fittings, but not far off it! After our first look at some prams in the store, we found that we were a bit better positioned to work out what our criteria for selection was going to look like… and as ‘older’ (late 30s) first time parents wanting a second child to follow relatively soon after our July 2019 baby, one of the main criteria that we locked in right up front was to go for a double/tandem pram. 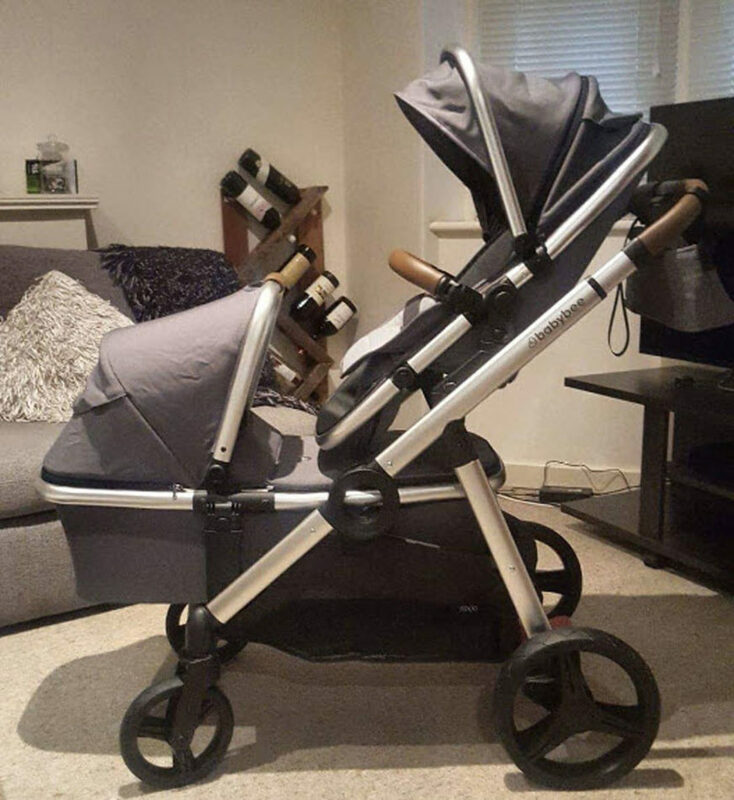 We do not know when (or if) a second baby will arrive, but we figured that it’s better to be set up ready to go with a pram that’s got good flexibility for however things happen to work out. 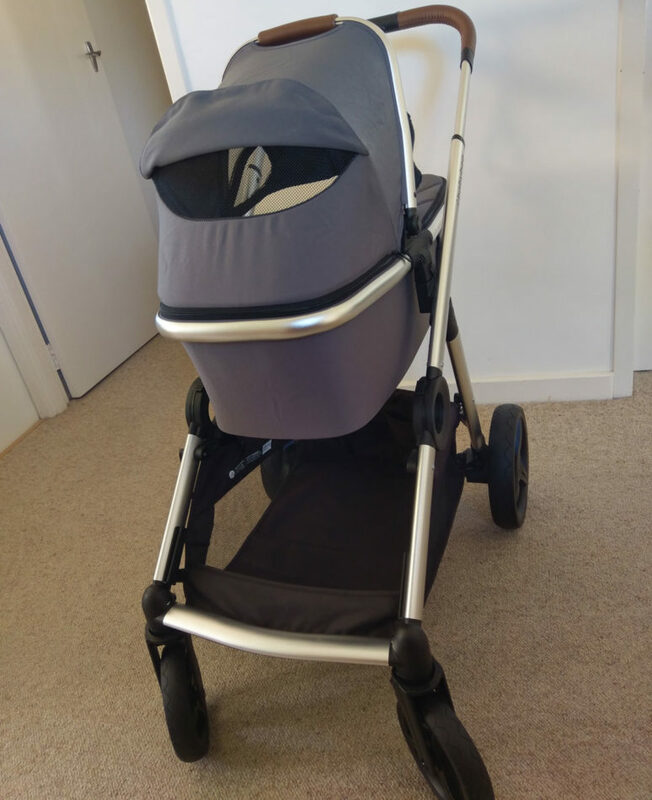 Now that we’ve had the chance to spend time with the Babybee Duo pram to check it out in more detail and really put it to the test against other prams, we are now locked in and happy with our choice. It looks good and feels as though it’s going to be up to the task. The 9.5kg frame has been designed to hold 2 toddlers at 20kg each (many double prams have a smaller weight limit for the second seat), plus an 8kg rating for the basket. Of course we won’t really know until it gets put to the test, but unlike some other prams that have a more flimsy feel to it, this Babybee Duo feels really solid… but without being heavy or feeling as though you’re driving a truck. We expect to be spending a lot of time out and about with baby and living up in the Adelaide Hills, the terrain that we encounter (and the places that we like to go) will mean that the pram will certainly be put to the test from the get go, but I do not have any sense that the frame will not be up to the job. It’s easy to tilt back onto the rear wheels for going up a kerb and feels quite stable when doing so. The wheels have a large diameter (which is important to make it easier to roll over rocks & sticks etc), but time will tell whether they continue to rotate and turn smoothly once it’s had a couple of years of heavy use. While there are advantages to having pump up tyres for the wheels, the fact that these prams have ‘puncture proof’ wheels means that we won’t ever have to worry about a flat tyre. Some friends have a 2017 model of the Babybee Rover and the soft compound of the wheels on their pram brought about the problem of gum nuts sticking into the wheel and being annoying. The Babybee Prams website seems to make special mention of improvements to the wheels so hopefully we’ll have a better experience along that line. The wheels do incorporate some degree of suspension, but it’s more of a “sports mode” (ie – stiff springs) rather than being soft and cushy. We’ll find out soon enough how well that performs. Ease of removing and inserting the seat or the bassinet. We found it frustrating having to carefully line things up on other prams. Bassinet is light to carry. Some are surprisingly heavy. Seat is fairly well balanced when picking it up by the “handle” (belly bar). Many are top-heavy and feel very awkward to carry. Comfortable, leatherette padded pram handle with 3 height extensions, and easy one handed operation. GREAT basket. There’s some really bad ones out there and this one seems to be one of the best. You can place items in from both the front and the back and the basket is open without inhibiting bars that some prams have across the middle. Really good extendable sun shade cover on both the seat and the bassinet. This is really a “standard” requirement for Australian summer sun but many prams don’t incorporate this. The seat recline on the Babybee Duo has a two handed recline and we’d prefer an easy single handed operation. The Babybee Rover seat has this functionality. The belly bar on the babybee Duo pivots open but does not pivot down out of the way. The Babybee Rover seat has this functionality. There is no pockets on the back of the Babybee Duo seat… but yet once again, the Rover seat has this functionality…… in fact, the Rover has a great size and very practical seat pocket. It’s a little strange (and annoying) that the Babybee Duo seat is unnecessarily different in these areas. Although the pram is easy to fold, the catch that I alluded to above is that the front wheels can’t be in the wrong position when you’re trying to fold.. Before folding (which is done from the front of the pram), you need to give the pram a bit of a ‘wiggle’ to change the orientation of the front wheels so that they are either pointed to the side or oriented in the direction that these wheels would swivel if the pram was being pushed backwards. This is something that needs to be seen and experienced to be understood, but it makes sense when you experience the problem. Interestingly… if you watch the last couple of frames on the Babybee Prams website where they show the folding of the Babybee Duo, a careful observer will notice that the direction that the front wheels face ‘magically’ changes so that the wheels do not clash with the frame (and inhibit folding). It’s a bit of a design flaw in my opinion, but not something that can’t be easily enough overcome through paying attention before you attempt to fold the pram. But it will trick new users… so first time parents or friends using your pram will likely get caught out at some stage. Overall though, it’s a great pram. The few negatives with the seat and the fact that the front wheels hitting on the frame can impact the folding aren’t enough to turn us off the product. We have purchased the adaptors for the Maxi Cosi capsule but we will wait until we need the second seat before buying it. Please note: While every effort has been made to ensure the information in this review was accurate at the time of publishing – please be aware that this is the opinion of the reviewer and not written by Parenting Central.